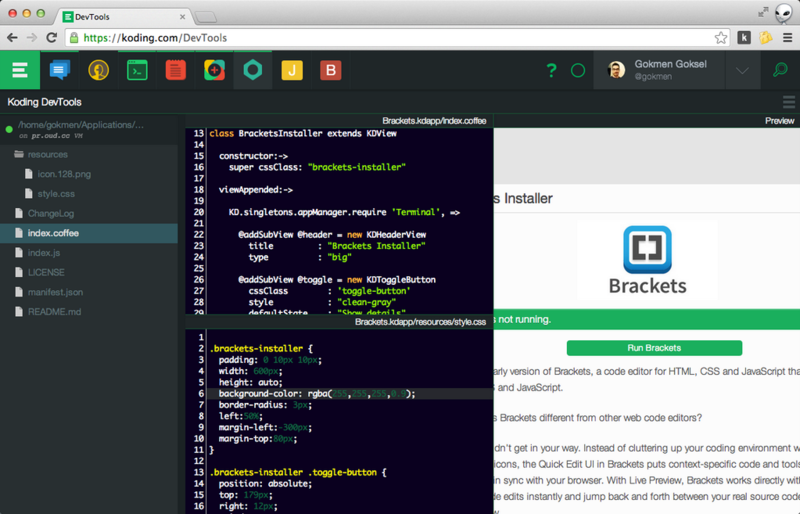 Announcing DevTools, Now Everyone Can Make Koding Apps! We have some great news for you, to start your weekend on a positive note. We’re super excited to announce the release of the new DevTools app, that comes preinstalled with all users accounts. We’ve been working hard on getting in ready and available for you. We’re also working really hard on releasing the documentation. Stay tuned on our public feed and social outlets for the announcement. So if you have an awesome idea, for an app that you’d like to share with others, you’re now able to develop it using the new DevTools, publish it to the Apps catalog and enjoy the fruits of glory. Ok, now go and code that awesome Koding app you’ve been postponing for so long. We’d love to feature the most awesome apps out there, so if you made an app and it’s awesome, drop us an email at [email protected] and we’ll feature it everywhere!